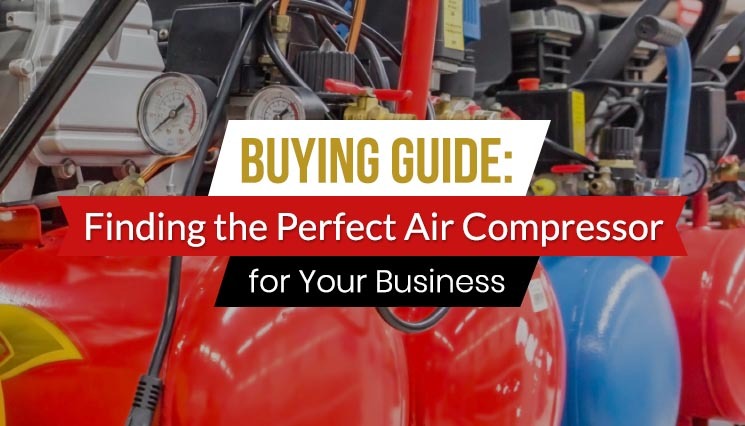 Buying Guide: Finding the Perfect Air Compressor for Your Business | Compresstech Resources, Inc. When buying a new air compressor, it is crucial that the one you choose fits your business. There is a wide selection of compressors to choose from, however, and some buyers may find the variety overwhelming. Here’s a buying guide to help you find the perfect air compressor. You will encounter certain terms while choosing a compressor. Understanding these terms is important when deciding between two compressors that both seem suitable for your business. Air flow refers to a compressor’s output. Another common term for this is free air delivery (FAD). It is measured either in cubic feet per minute (CFM) or litres per minute (L/min). Pressure, the force of the compressed air, is expressed in pounds per square inch (psi) or in bars. Displacement refers to the ideal capacity of a given compressor. It is determined by the compressor’s speed and the size of the compressor pump’s cylinders. Like air flow, it is measured in CFM. However, it does not absolutely indicate the power of the compressor. Before looking for a compressor, you should first determine the required CFM of your equipment. This commonly listed specification can be found in manuals. If you use multiple tools simultaneously, simply sum up each tool’s required CFM. It is advisable to further multiply this sum by 1.2 as a safety buffer. The grade of a compressor is related to the intensity of work that it can carry. It is inefficient to have an compressor which is too small for your equipment. On the other hand, an oversized compressor equates to wasted money and higher maintenance and energy costs. Be sure that you choose a compressor with the right grade. Consumer Grade – suitable for smaller air needs around the house, such as inflating tires and toys. It can also power staplers and brad guns. For larger tools or simultaneous usage of several tools, however, you will have to pick a more powerful compressor. Contractor Grade – provides enough power for for job site demands. Compressors of this grade are also portable. They can power nail-guns and roadside repair tools. Commercial Grade – heavy-duty and able to provide an uninterrupted supply of compressed air. Examples of applications requiring commercial grade compressors are auto repair shops, factories, amusement park rides, and oil rig machinery. Most compressors can be classified as either reciprocating piston or rotary screw, depending on how a given device performs air compression. Reciprocating piston compressors are low-maintenance and able to output pressures of 1500 psi upwards, while rotary screw compressors are more durable and designed for continuous use. Read more about the differences between these two common air compressor types here. Air compressors can either be electric or gasoline-powered. Electric compressors are the most common models. They require less maintenance than gasoline-powered models, are quieter and work in any dry area with a ready electrical supply. Electric compressors are suitable for working indoors. A portable electric compressor requires a suitable extension cord, which limits mobility. Gasoline-powered air compressors are a good choice for outdoor work areas where electricity is limited or unavailable. They typically have more horsepower than electric models, so they can generate greater psi. There are several other features that you may also consider looking for when selecting an air compressor. An oil-free air compressor does not require maintenance and runs no risk of contaminating the compressed air with lubricant. An oil air compressor, on the other hand, is quieter and more durable. Oil-free compressors are sufficient for household applications while oil air compressors are suitable for industrial applications. To prevent your motor from sustaining overload damage, you may opt for a thermal block. Adjustable exhaust helps you avoid inhaling fumes by directing exhaust elsewhere. If your work requires you to switch between tasks without connecting a different set of tools each time, you can purchase multiple couplers. Take note of whether or not your air compressor of choice comes with accessories and tools, such as air hoses or nail guns. On the outside, this all might appear to be a matter of comparing devices based on grade or power supply, but the right choice will lead to reduced costs and greater efficiency overall. The perfect air compressor can help your business pull away from the competition. Follow our newsroom for more helpful articles and expert advice on compressed air systems technology in the Philippines.